Photographs by Annie Crawley. 48 p. Millbrook Press/ Lerner, April 1, 2014. 9781467712835. 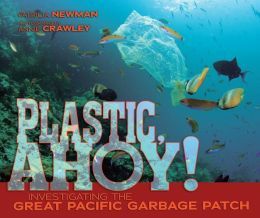 Three grad students spent three weeks on board the ship, New Horizon, participating in the Scripps Environmental Accumulation of Plastic Expedition (SEAPLEX) in 2009. They were part of a crew who motored out to a huge area in the Pacific Ocean know as the Great Pacific Garbage Patch or the North Pacific Central Gyre, formed by four oceans and the winds and currents which direct plastic and other bits of pollution to the area and don’t allow it to escape. Once they hit the gyre, they were hard at work collecting samples on the surface and below. The crew collected plastic in “130 of their 132 net tows over 1,700 miles of open ocean.” (36) While plastic doesn’t biodegrade, it does break down into smaller and smaller pieces. Pieces that are ingested by sea life. Pieces that contain poisons. The scientists hope to discover how this affects the animals. The book is attractively designed. Pages have an hombre background of sea green. They are filled with plenty of crisp, full-color photographs, maps and interesting text boxes and sidebars. A final chapter includes information about what the reader can do to help reduce this problem. The back-matter includes links to some videos of the SEAPLEX team in action, other websites as well as books for further reading. Source notes, a glossary and index round out the volume. I’ve mentioned before on this blog that I love these types of science-in-real-life books. This one belongs right up there with my best-beloved titles. I heap some additional love on it because the scientists are young and female, hopefully encouraging more young women to consider studying science. The text and photographs work together so effectively to hammer home the seriousness of this problem and encourage the reader to rethink habits. This book will fit in beautifully in several curriculum areas at my school, especially in seventh grade science. Surely a must-purchase item for school and public libraries. In the aftermath of World War II, many Nazi leaders were made to account for their transgressions and accept punishment for their role in the Holocaust of over 6 million Jews through the Nuremberg Trials. Some of the most horrific actors, however, managed to escape Germany, fleeing to other countries and assuming new identities in hopes to evade capture and accountability. One such man was Adolf Eichmann, the head of operations for The Final Solution – the rounding up and shipping off of Jews to death camps. After the war, Eichmann fled to South America and lived there for many years without anyone’s notice. After a team of Israeli spies are tipped off to his whereabouts a massive covert operation spanning several years begins. The goal: take Eichmann alive and willing to stand trial for his crimes in Israel. And don’t let anyone find out about the plan until he’s been safely transported to Jerusalem. Filled with suspense and research backed by interviews, tons of photos, forgeries and kidnapping diagrams, you’ll quickly understand why this title won the 2014 YALSA Excellence in Nonfiction Award. A must for any collection for 12-18 year olds*. *Oh, and the trim size only adds another reason to love this book. I can’t be the only middle school librarian who squeals with delight when a nonfiction book is published in trade size (like a novel) instead of picture book size, can I? I can’t get my kids to read the ones that look like picture books, but they will eagerly checkout something that *looks* like “adult” nonfiction. Below is my starred review of The Boy on the Wooden Box: How the Impossible Became Possible on Schindler’s List, as it appeared in the February, 2014, edition of School Library Journal. on Schindler’s List. 4 CDs. 4:15 hrs. Recorded Books. 2013. $46.75 ISBN 9781470369439. Playaway. Digital download. Gr 4-9–In an intimate look at one family on Oskar Schindler’s famous “list,” Leyson’s (born Leib Lezjon) memoir (S & S, 2013) begins with his earliest memories of his poor but idyllic life in a Polish village. His large Jewish family was short on money, but never on love or a sense of purpose and belonging. They eventually move to Krakow, a city that Leib finds enchanting. 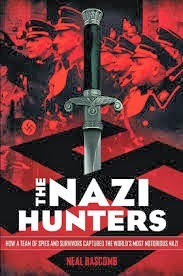 When the Nazis invade, however, life becomes desperate for the 10-year-old protagonist, his parents, sister, and three brothers. By sheer happenstance, Leib’s father becomes a worker for Schindler, beginning a chain of improbable events that leads to Leib’s survival, despite pogroms, ghettos, and Nazi work camps. Young Leib’s feelings of fear, dread, and despondency are relayed simply. Narrator Danny Burstein speaks in decorous, measured tones, yet sounds conversational. The words have power, no embellishment is necessary. Despite the horrific subject, Burstein imparts Leyson’s peaceable nature and even delivers a natural-sounding laugh or chuckle when relating the rare bright spots. Leyson here shares only his own memories and does not speculate or pontificate on the larger story. If he does not know the fate of a relative or friend, that uncertainty, too, is part of his story. Randomness, luck, and split-second actions that delineated life and death–these are the truths of the Holocaust, and of those on Schindler’s list. A moving and heartfelt conveyance of Leyson’s gratitude to his family and to Oskar Schindler. Copyright © 2014 Library Journals, LLC, a wholly owned subsidiary of Media Source, Inc. The Boy on the Wooden Box was recognized as an Honor Book for Older Readers in the 2014 Sydney Taylor Book Awards. You can find other “book reviews (and news) you can use – for busy librarians, teachers and caregivers” at Shelf-employed. Copyright © 2014 L Taylor. All Rights Reserved. Do you work with children who always grab fiction, leaving the nonfiction on the shelf? Weeds Find a Way by Cindy Jenson-Elliott and illustrated by Carolyn Fisher is a perfect example of the kind of picture book that will entice the fiction addict to give nonfiction a try. Jenson-Elliott’s text conjures up lighthearted word pictures. For example, can’t you imagine seeds coming out of pods “…like confetti from a popped balloon?” As a perfect complement, Fisher’s mixed media and digital collage illustrations are intriguing and playful. The back matter includes a serious discussion of weeds, including why they are interesting and important, and a list and descriptions of some common weeds. For a full review and related activity suggestions, visit Growing with Science. 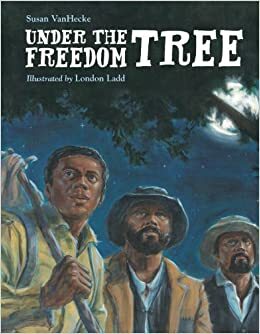 Booktalk: One night in 1861, three escaped slaves made their way from the Confederate line to a Union-held fort. The runaways were declared “contraband of war” and granted protection. As word spread, thousands of runaway slaves poured into the fort, seeking their freedom. 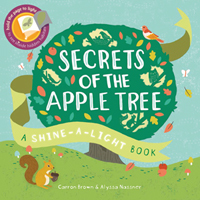 If you want to know the secrets of the apple tree, you’ll need a flashlight or a lamp. In this inventive book about the apple tree, hidden pictures are included behind the illustrations. Placing a light source behind the page, you can see the hidden picture. The first picture is a full apple tree with the question “Can you see what it looks like in winter?” Flash a light behind and you see a bare branched tree with birds. The following page talks about animals living around the tree. A bird’s head is perched barely above the ground. The question for this page is “Can you see who the bird is about to grab?”. The light will reveal wriggling worms working to loosen soil. On the back side of each illustration is an explanation of the answer to the previous question. All aspects of life in and around the tree are explored. What’s under the leaves? Be careful because you might disturb a frog. See a tail poking out of a rock? You’ll find a lizard looking for insects and other food sources. A great exercise to do with children before reading this book would be to list all of the animals you think might live in or around the tree. A circle map would be a good format for doing this. Another skill that you could work on with Secrets of the Apple Tree is teaching main idea. Read the whole book and ask students to think about the big idea of how this tree is valuable to so many living creatures. Find out more about this new book at NC Teacher Stuff. Cate says, “You don’t have to go anywhere fancy to watch birds!” And it seems you don’t need to know their fancy Latin names either! What about binoculars? Do you really need one? Annette LeBlanc Cate’s “Look Up! Bird Watching in Your Own Backyard” invites you into your own backyard to look up and around and spot some birds. But before you begin, she gives us a useful list of Bird Watching Do’s and Don’ts, what not to bring with you and what you need to make this activity useful and fun.